This tutorial explains how to enable Homebrew on the Xbox 360. 360-HQ.COM, it's staff, administrators and moderators take NO responsibility for users who attempt this modification. In this writeup I’m going to try to explain the beginning users how to get going with homebrew, also in an attempt to get as many users going with homebrew Xbox 360. As it may look difficult and a lot of work to some, I on the other hand did not share this though at all. In fact I learned to solder on an old broken board from which I could still read the NAND with the LPT method. 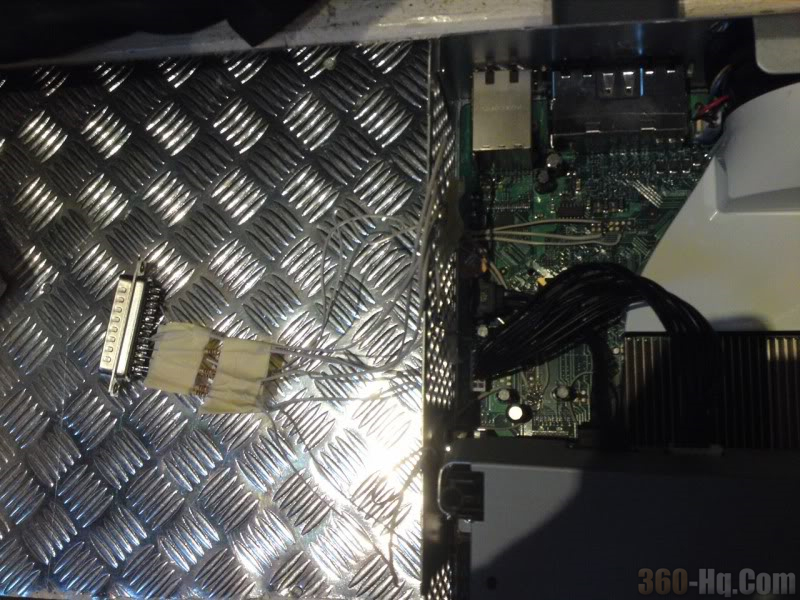 From there on I now succesfully and without much problems, prepped 1 Falcon and 1 Jasper with XBReboot v0.05 8955_1. It’s not really that difficult at all I can tell you, because if I can do it, anyone else could. It’s also been an good learning experience so far and everything is well documented. In this tutorial all you’ll learn is to use LPT to read/write and get XBReboot going. I’m not going to make it too easy for you guys. After you’re done soldering all wires it’d be wise to check the connections with a multimeter, but I have not yet needed to do this -with my poor soldering skills - I lol.. Also to avoid wires touching, I use paper tape to cover the wires up. 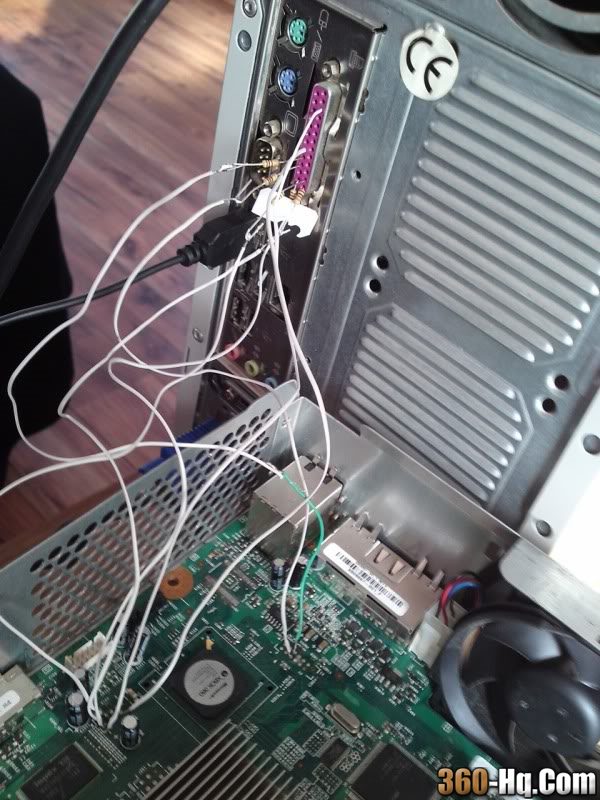 To prevent connections from breaking it’d be wise to secure the wires with hot glue, or tape. Here’s my latest setup. plug in only the power supply to the Xbox 360. If you can’t get it to detect, try out different BIOS settings for the LPT port (What works for me is Normal mode), or look for people having the same problems with Nandpro (Google). Also run through your wiring again. Make sure you hooked all wires up OK and double check connections. 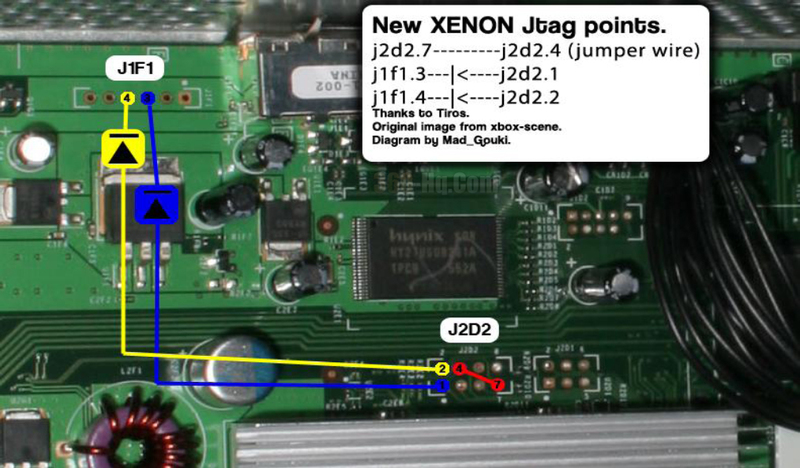 People say to remove the resistors as well but I would not dare to say this as it could possibly fry something on your Xbox 360. Here’s you are going to be making an XBReboot image for your consoletype, using your console specific keyvault. You will need to get the corresponding XBReboot image from Xbins!! 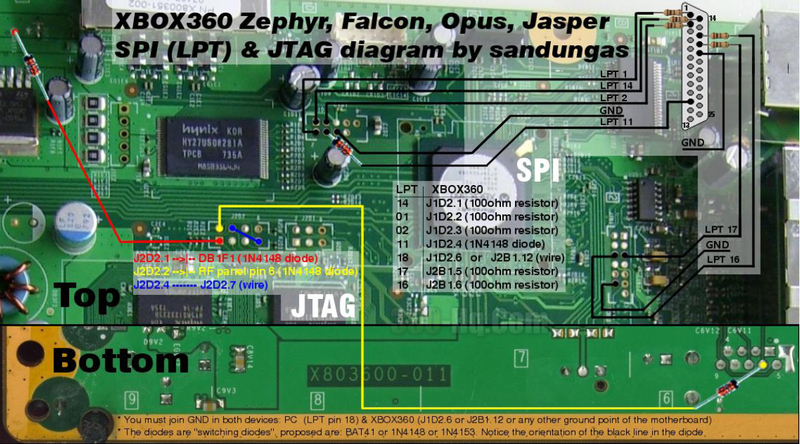 If you flash the image of a Falcon to a Jasper you’re stupid. Always make sure you are prepping the right image for your Xbox 360 it’s not hard to find out. If all goes well, you should have an XBReboot 360 =) This is all that it takes. Really not that hard and fun to do. Now you can get started with MAME360, Beats of Rage, CPX3, XEXLoaders and the rest that is to come =) Or you could make your own software now. Somewhere in time to come Xbox Media Centre =) Or you could start modding Halo 3, which is a lot of fun. Now what are you waiting for. Get going on getting an exploitable Xbox 360 to do all these crazy homebrews with.